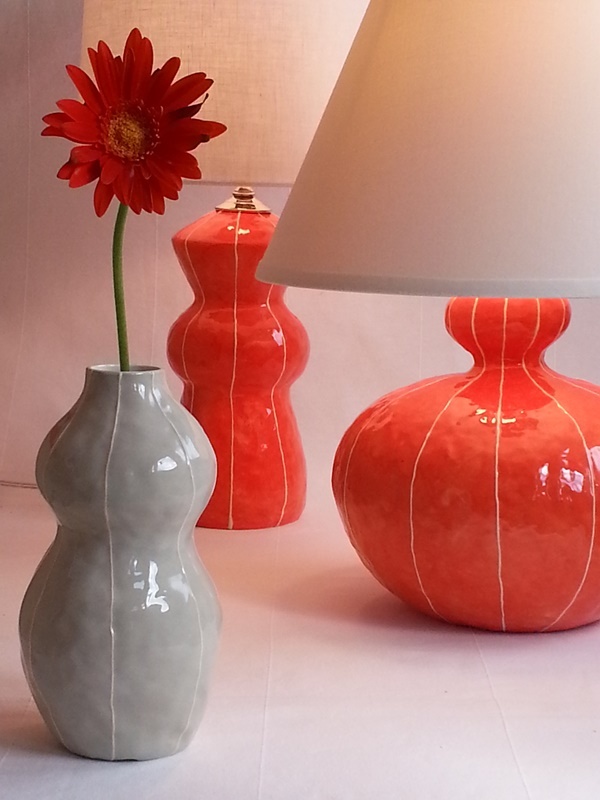 The Gourd lamp is the latest shape in my collection of handmade ceramic lamps from Kri Kri Studio. This June they will debut at the dwell on design 2014 show in LA along with the VIT ceramics range of vases. The form has a slightly irregular perfection, the result of being built up by hand using the coil and pinch technique. This method of construction also allows for traces of the artist’s touch to remain in the softly textured surface. Large, ripe and full of life, the form adds warmth to a room, especially in juicy coral-red. With each available color the personality and mood of the piece changes. Considered in gray, the Gourd lamp is feminine and elegant. However, in yellow it is positively buoyant! Jade green, taupe and Danish blue are also offered. Creating this collection has been a refreshing change from producing my tableware. I feel I am returning to my roots as a sculptor and find that the lamps are a wonderful vehicle for expressing forms. They are also a pleasing way to combine art and functionality. With a simple off white linen shade to compliment the hand drawn white stripes, the Gourd lamp stands 22″ tall x 15″ wide.